There was finally some dose of reality in the December jobs report. But as weak as the headline number was (and it was very weak), the details were even worse. 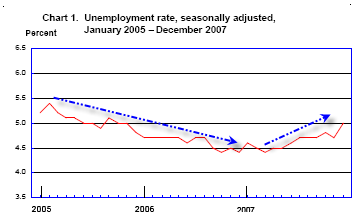 Let's take a look at The Employment Situation: December 2007. The unemployment rate rose to 5.0 percent in December, while nonfarm payroll employment was essentially unchanged (+18,000), the Bureau of Labor Statistics of the U.S. Department of Labor reported today. Job growth in several service-providing industries, including professional and technical services, health care, and food services, was largely offset by job losses in construction and manufacturing. Average hourly earnings rose by 7 cents, or 0.4 percent. The trend in unemployment is now clear. It is headed up. The household data is the number off which the unemployment rates is based shows a whopping rise in unemployment of 474,000 for December. But the number is even worse because of the 179,000 workers who left the work force. We can see the effect in Table A-12: Alternative Measures of Labor Underutilization. Table A-12 paints a story that is much closer to the truth. "U-6 Total unemployed, plus all marginally attached workers, plus total employed part time for economic reasons, as a percent of the civilian labor force plus all marginally attached workers" rose from 8.1% last month to 8.7% this month. Those who talk about a "low unemployment" rate are simply not looking at the right data. 8.7% is much closer to reality than 5%. The Establishment Data Was Horrid. 49,000 construction jobs were lost in December. 31,000 manufacturing jobs were lost in December. A whopping total of 75,000 goods producing jobs were lost. In general, those are the higher paying jobs. Of note, 24,000 retail trade jobs were lost. Christmas sales were weak. Guess where this number is headed. 93,000 Service Providing jobs were created, but 31,000 of those were government jobs. Total everything up and private non-farm jobs contracted by 13,000 jobs in December. Is government going to be the employer of last resort? When I first saw the headline number I thought the BLS finally got the right picture on a contracting economy. Nope. I was wrong as the following chart shows. The BLS birth/death model has added jobs 11 consecutive months now. This includes financial activities in an environment where business capex spending has been weak, housing has been horrid, and over to 210 lenders have gone out of business or stopped writing loans according to Implode-O-Meter. In spite of horrible housing conditions, the BLS has assumed there have been more business births than deaths in 9 of the last 11 months in construction. What I said last month in November Jobs On Bizarro World is even more true today. There is still a lot of catching up to do on those construction assumptions. Eventually we will see higher negative revisions in the months to come. I am still struggling with 11 consecutive months of birth death additions to financial services in light of imploded lending. Even though "imploded" does not imply out of business, the number of small 1-5 person shops that have ceased doing mortgage related business has to be staggering. Those numbers are not reflected in Implode-O-Meter stats or in the birth/death model revisions. The BLS birth/death model has now added 1,305,000 jobs to the economy since February. That model remains somewhere in outer space.